My sage plant is running rampant. What shall I do?? There is not much I eat with sage, other than Thanksgiving Day stuffing. A hot plate of stuffing is exactly what I don't want in July. I walk by my sage plant and run my fingers through it to smell it. Its kinda musty and gross. I wasn't sure I'd like the sage in this sauce, but I do. Oh, yes, I do. Actually, the sage was the best part!! I wanted more of those crisp-ity, butter-ery little sage bites. The flavor competely mellowed out. Yumma!! Prepare ravioli according to package directions. Drain. Set aside. In a small skillet, preferably a light colored one (so you can see the correct color of the browning butter before it burns), toast your walnuts over medium heat. After the walnuts are toasted, remove nuts and add butter. After the foaming subsides, add sage. Continuously swirl the sage in the pan and carefully watch the color of the butter. You may want to remove the pan from the heat occasionally. Do not burn your butter! It will take about 2-4 minutes for your butter to become a caramel color. Remove from heat. Plate ravioli. Drizzle with butter. 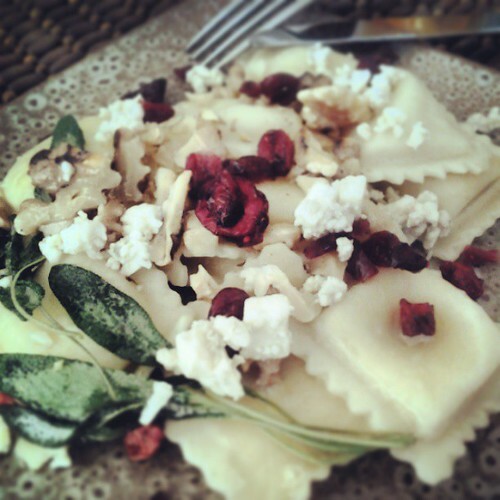 Top with cranberries, walnuts, bleu cheese and sprigs of sage. Season with fresh cracked pepper. Buon Appetito! !